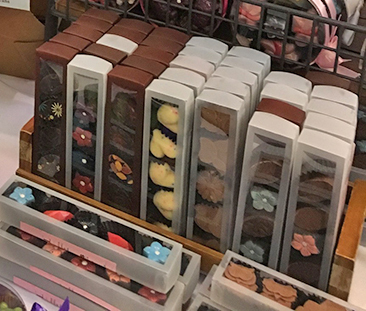 At this year’s truffle artistry judging, there was a reasonable number of truffles to sample (about 30), but that was due to a lot of chocolatiers missing the deadline. I am sorry they were disqualified, but my stomach thanks them. Some of my choices for top truffles are available on the chocolatiers’ websites; others were limited editions that you might be able to get if you ask them nicely. Spiked is a good way to put it, because this is a super boozy bonbon, but that is how it should be. Since the whiskey is the featured flavor, it has to come on strong. Beth’s Chocolate picked a great whiskey and balanced it with good chocolate. Whiskey and chocolate can be a magical combination when done right; this is a good example of that. On top of picking the right ingredients, the ganache was very silky and the shell a perfect thinness. And it was pretty too, with a freehand swirl of gold on top. It received a 4.5 Star Rating (the highest rating this year), plus Gold for Best Overall Truffle Artistry and Silver for Best Taste. Another single entry truffle, this one from new local chocolatier discovery: Charlotte Truffles, in Santa Clara, CA. I was surprised how much I liked this because I am generally not fond of floral flavors, but this was lightly rose, not perfumy. It was also not overly sweet. The interior was layered with a liquidy white chocolate cardamom ganache and rose water/saffron jelly. I can’t say I could taste the saffron; I think it was there to support the rose taste, but I know it was there because there were strands of saffron inside the truffle. This was also a pretty piece of candy, like a miniature pink speckled geodesic dome. It received a 4 Star Rating, plus Gold for Best Overall Truffle Artistry, Silver for Most Unique, and Bronze for Best Taste. 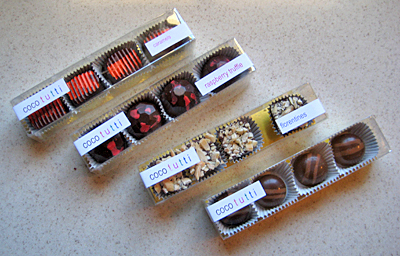 Local fave CocoTutti submitted 2 winners. The Luxardo Cherry was borderline too-pretty-to-eat with its speckled red sphere embellished with a green swirl that looked leaf-like. Professionalism required me to not only admire its looks, but also taste it, and I’m pleased to say it was beautiful all the way through. Luxardo is a brand from Italy that boasts it created the original maraschino cherry, and they still make preserved cherries and cherry liqueur the old-fashioned way. For each bonbon, CocoTutti placed a chewy Luxardo cherry inside ganache inside a dark chocolate shell, which resulted in a very cherry candy flavor. If the thought of a maraschino cherry candy turns you off, know that this is not those artificial looking and tasting cherries you grew up with. These are candied fruits that are still cherry through and through. The Luxardo Cherry received a 3.5 Star Rating, plus Silver for Best Overall Truffle Artistry and Best Taste. CocoTutti’s Strawberry Balsamic truffle was so aromatic, we smelled strawberry as soon as the box was opened. Unlike the Luxardo, which relied on a brand name ingredient for the flavor, this bonbon was more typical of CocoTutti’s line, in which they make the preserves, nut butters, and other ingredients that flavor their truffles themselves. The strawberry flavor came from house-made preserves mixed in ganache. The flavor and texture were like strawberry jam and butter mixed together with the creamy ganache and tiny bits of strawberry. 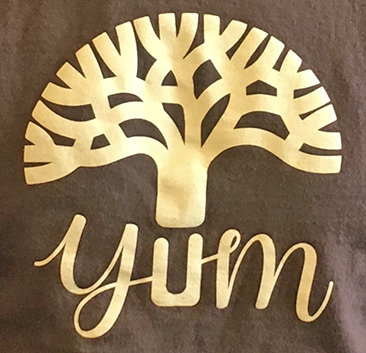 It received a 4.5 Star Rating, plus Gold for Best Overall Truffle Artistry, Silver for Best Taste, and Bronze for Best Exterior Design and Best Ingredient Combination. Another local chocolatier, the artistic flying noir out of Oakland, CA wowed the panel, me included, with the 6-piece poetry & prose collection. I confess, I don’t know the literary references for these pieces, but that didn’t affect my appreciation of these chocolates at all. First of all the packaging is so pretty with its simple black box surrounded by a handmade wrap colored with purple and silver. This was the most attractive, unique packaging in the competition this year. I was disappointed in how few of the entrants put a lot of thought into their packaging, especially after my trip to Europe this year, where even the small chocolatiers put a lot of effort into packaging and branding. I think the package should be as special as the chocolate inside, and I appreciate flying noir’s efforts in this area. Inside the box, the visual treats continue. Each piece is a unique shape and treatment, but all are decorated with natural colors and/or sparkly mica. It feels special even before you taste the first piece. 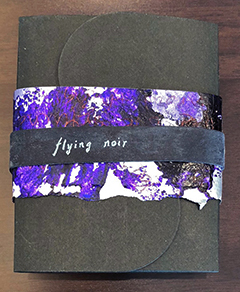 Flying noir is very experimental with flavors and textures; and this entry was no exception. “Diamond Moon” was a super hard and crunchy cylinder of bittersweet chocolate with a citrus upper note coming from the caramelized bergamot zest. Normally, I don’t like hard solid cubes of chocolate, but the crunchy bits of zest created breaking points, so it wasn’t frustratingly hard. I liked its unexpected resist-and-give texture. The “Quatre” looks like a miniature hunk of pinkish fool’s gold with its crunchy sugar-and-salt coated exterior. Inside was a smooth soft ganache full of fall spices and a nice brandy burn, which all paired well with the crunchy shell. “Calling” was probably the most conventional looking piece in the box with its bright blue and red veins dragged across an elongated triangle. But it was crunchy too with bits of praline made from caramelized chiles, and it had a nice hot surprise at end from the chiles and peppercorn. “Marco” was a little slab of almond gianduja (think Nutella but with almonds and higher quality) that had a texture and taste like almond butter initially. As it melted, I tasted ginger, and finally the Aleppo pepper added a nice warmth at the end. 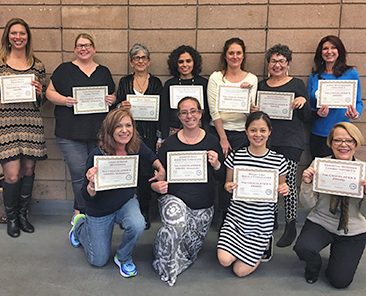 The poetry & prose collection did especially well in the judging too with the highest rating and placing in every category. It received a 4.5 Star Rating, plus Gold for Best Overall Truffle Artistry and Best Packaging, Silver for Best Taste and Best Ingredient Combination, and Bronze for Most Unique and Best Exterior Design. 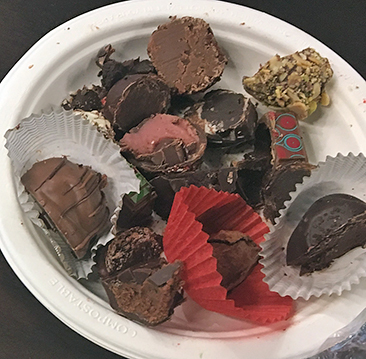 Our newest local chocolate crush, Michael’s Chocolates of San Francisco, submitted 2 entries to the judging. Pistachio Cardamom was a layered piece, with white chocolate ganache on the bottom and milk on top. The piece achieved a difficult feat: Mild yet distinct pistachio flavor that wasn’t overwhelmed by the cardamom, but balanced together. It received a 4.5 Star Rating, plus Gold for Best Overall Truffle Artistry, Best Taste and Best Ingredient Combination; Silver for Most Unique; and Bronze for Best Exterior Design. Michael’s Chocolates’ Coffee Toffee truffle was just as nice, if more conventional. It was also a layered-ganache bonbon with a white-chocolate-caramel-toffee layer on top of a dark-chocolate-coffee layer. It had a very nice coffee flavor in good chocolate. And it was presented in Michael’s sophisticated black quilted boxes that are evocative of high-end handbags. It received a 4.5 Star Rating, plus Bronze for Best Taste and Best Ingredient Combination. Panache is a chocolatier in Kansas City, MO. They submitted 3 entries, but I really liked their Classic Cocktails collection of 4 pieces inspired by different bourbon/rye cocktails. They used locally distilled Bourbon and Rye to create their cocktail truffles, which were all like a nice shot of booze with a little something extra. For example the Brown Derby had an interesting texture and citrusy overtone but also tasted of cinnamon, which I didn’t expect but enjoyed. The Manhattan was more understated, slightly fruity, with a boozy aftertaste. The Old Fashioned was boozy and citrusy with a little crunch from the smoked sea salt and dried orange crumbles on top. The Mint Julep had a strong minty scent, maybe from the candied mint leaves decoration, but I didn’t care for its strong minty, herbaceous taste. It was also too sweet, like mint juleps tend to be. These would make a nice gift for someone who likes cocktails. The packaging is understated: brown box with caramel colored wrapper. 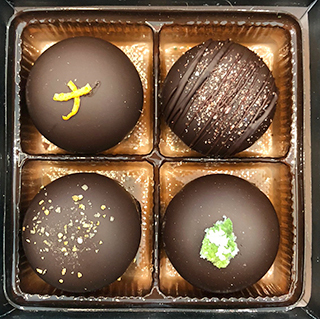 But the pieces themselves look very special-occasion: big, round dark chocolate bonbons with refined decorations to easily identify the different cocktails. The collection received Silver for Best Overall Truffle Artistry and Best Packaging, and Bronze for Most Unique. Temper & Mo, from Eugene, OR, entered one piece from their “Chocolate Healing Stones” collection. The Elderberry Apple Swirl, AKA Aquamarine was designed like the rest of the collection to mimic the appearance of different gemstones. Someone at the tasting said it looked like a mood stone, more than a gemstone with its layered swirls of blue and white. The inside continued the swirly theme with swirls of dark elderberry and light apple ganaches. This was not only visually interesting but you could taste both fruits distinctly. The only downside to the piece was a thick bottom shell, but that’s a small quibble. I’d be very interested in trying the other flavors in this collection. 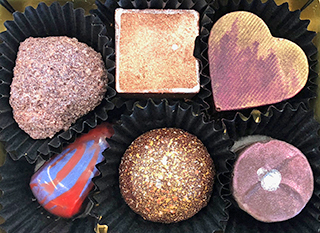 It received a 4 Star Rating, plus Gold for Most Unique, Silver for Best Overall Truffle Artistry, and Bronze for Best Packaging, Best Taste, Best Exterior Design and Best Ingredient Combination. Other entrants in the Truffle Artistry Awards 2018 did not rate as high in my opinion, but there were some to take note of for different reasons. One of these was a new truffle trademarked by Seleuss. The Saffroncello™ is a white chocolate ganache truffle flavored with Persian saffron and limoncello, an Italian lemon liqueur. According to its label, it comes enrobed in either dark chocolate or white chocolate and sprinkled with granulated orange peels on top. We got the white chocolate version which resembled a sunny-side-up egg when cut in half with a bright yellow orb of ganache inside a white chocolate shell. Unfortunately the combo tasted so weird I spit it out. Maybe they can tweak the recipe (less saffron — a lot less saffron). It received a 3-star ranking, plus Bronze for Best Overall Truffle Artistry and Most Unique. Boreal Vegan Chocolatier from Madrid, Spain, sent in 3 beautiful entries. I wanted to love these truffles because they were so pretty, but I think in going vegan, they lost too much on the taste side of the equation. The “Fruity Swirl” was a beautiful dome painted with fine blue lines encircling the dark-purple piece. But the shell was too thin and broke under the slightest pressure. Inside was a vegan marshmallow on top of a layer of raspberry pate de fruit with a fruit dot inside the bottom layer. The marshmallow was insubstantial, more like a foam than a fluffy marshmallow. I don’t know if that is a consequence of it being vegan or something happening in transit, but the piece just disappeared in my mouth without any strong tastes or luxurious mouthfeel. The “Oriental” was another beautiful piece with green fringe encircling the bottom half of a white painted truffle in a twisted bar shape. It looked like a painted line of grass growing up from the bottom of the piece. It featured matcha tea in white ganache layered on milk chocolate in dark shell, but it was not a good matcha taste. It was bitter with a nut overtone. I was disappointed because good matcha can make me like white chocolate, such as Socola Chocolatier’s Crunchy Matcha Green Tea White Chocolate Bar. It received a Silver for Best Exterior Design. Their 3rd entry, “Picos de Europa,” was decorated to evoke snow on the peaks of Europe, with white coloring dabbed on a green painted truffle, like snow on mountain tops. Inside a jelly layer sat on top of a layer of white ganache. I’m not sure what the flavor was supposed to be, it tasted a little fruity and sweet like icing, and again the filling was insubstantial. The last entry I want to note is Hot Tempered Chocolates’ Cara Cara Coconut. They were so beautiful with their splashes of orange and turquoise on a white background. And you could choose whether you wanted the blue or the orange as the dominant color on your sample. The inside resembled a Mounds bar: you could see the coconut texture in the white ganache surrounded by the dark chocolate shell. The pieces were very coconut-y, with only a slight orange taste from the cara caras. I was disappointed because cara caras are my favorite orange, very sweet and juicy, so I expected a more robust orange flavor. It received a 3-star ranking, plus Gold for Best Exterior Design and Bronze for Best Overall Truffle Artistry and Best Ingredient Combination. Visit the TasteTV site for the full list of winners and awards. Date posted: November 13, 2018. This entry was posted in American chocolate, East Bay chocolate, European chocolate, Featured, Front page, Local chocolate, Outside the Bay Area, Peninsula chocolate, San Francisco chocolate and tagged Beth's Chocolate, Boreal Vegan Chocolatier, Charlotte Truffles, CocoTutti, flying noir, Hot Tempered Chocolates, Michael's Chocolates, Panache Chocolatier, Seleuss, TasteTV, Temper & Mo. Bookmark the permalink.